While gutter cleaning might not be on the top of your list of things to take care of around your house, if you put it off for too long it might cause damage to your home that can cost you thousands of dollars. Instead of hoping that nothing bad will happen, call us at RA Landscaping in Florissant and have us take care of your gutters. We have all of the equipment needed to complete the job safely and we have the experience that lets us work more efficiently than the rest. Your gutters are designed to move precipitation away from your home. Without gutters, rain water can make its way in between siding and against the foundation of your home. This moisture can cause damage to wood, stone, and concrete, as well as attract pests and create conditions which facilitate the growth of potentially dangerous molds. If your gutters are clogged with debris like leaves, pine needles, and dirt, not only does this prevent your gutters from doing their job correctly, it can lead to other problems. It doesn’t take too long for the collection of debris in your gutters to become a nutrient-rich bed of material where small plants can start sprouting. Twigs, leaves, and other detritus will attract birds, squirrels, and other animals that can cause damage to your home or who can become aggressive when you try to clean out your gutters. 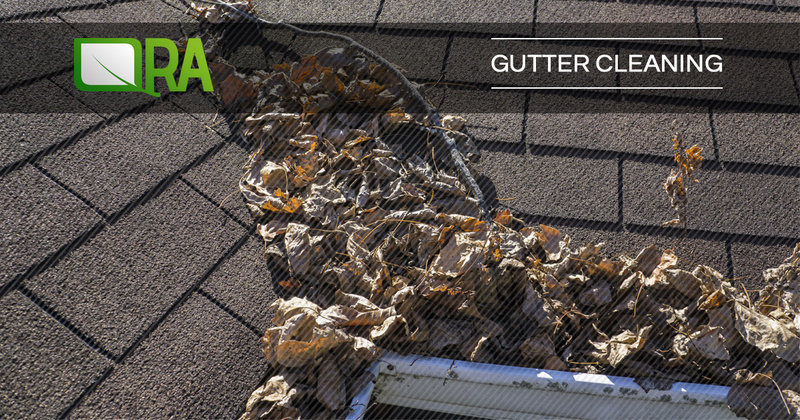 Keeping gutters clean prevents plants and animals from taking over your gutters. Add gutter cleaning to your regular landscaping services, and we’ll make sure that your gutters are ready to handle spring and winter storms. Ra Landscaping proudly serves the following neighborhoods in St. Louis: Bellefontaine Neighbors, Black Jack, Breckenridge Hills, Bridgeton, Ferguson, Florissant, Hazelwood, Riverview, Overland, St. Ann, and St. John.